Sometimes a little humour is necessary when calling out injustices. This dad did just that, calling out his daughter’s school for a sexist policy around a casual day using time travel. And the letter Stephen Callaghan sent to his daughter Ruby’s teacher has serious implications too. Ruby wants to be an engineer, and when she was offered the chance of a ‘Boys and Girls Day’, she had asked if she could go to a Bunnings hardware shop and to have the BBQ lunch offered to the boys. But the 12-year-old was told by her teacher at the Dubbo West Public School in Wongarbon, Australia, that the trip was only for the boys. She was told she should remain in the library with the girls to have her hair and makeup done. “I must draw your attention to a serious incident which occurred yesterday at your school where my daughter Ruby is a year 6 student. 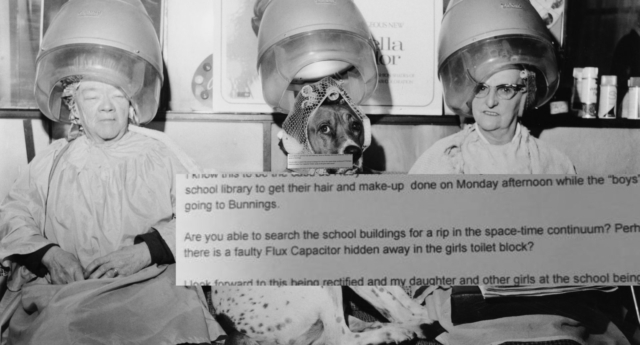 “I know this to be the case as Ruby informed me that the “girls” in Year 6 would be attending the school library to get their hair and make-up done on Monday afternoon while the “boys” are going to Bunnings. In response, a Department of Education spokesperson told Bored Panda that students are allowed to choose either activity. And in the meantime, his letter has been shared thousands of times with many calling out the Boys and Girls day for unnecessarily segregating genders. And despite some trolls trying to give Callaghan a run for his money, he simply responded: “Oh look…the first of the floorshitters has arrived.